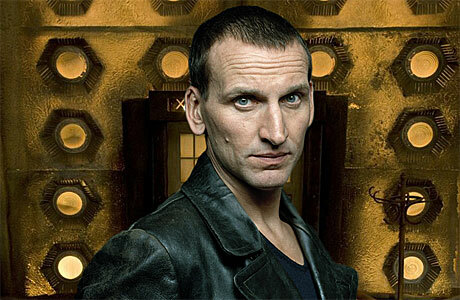 I'm going to warn you right out of the gate - I'm not a big Doctor Who fan. It's not because I dislike the show, but rather have had very little exposure. I keep meaning to watch, but never seem to find the time. Still, you can't hang in the nerd-verse without picking up on the show through sheer osmosis. And I have been paying attention to the work Big Chief Studios has been doing with the license (as well as with Sherlock), and the pros and cons to date. 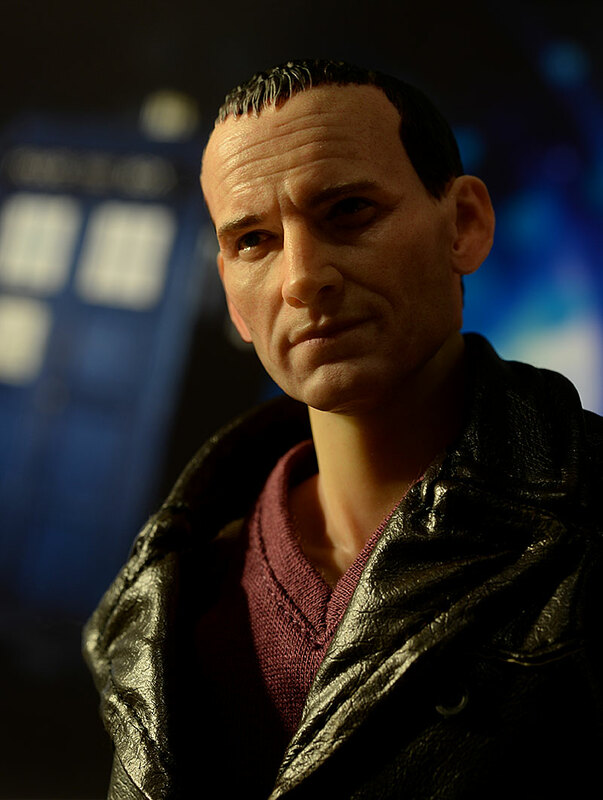 It was therefore with great interest that I received the soon to ship 9th Doctor in all his glory. This guy will start shipping within the next couple weeks, and will run you (at least in the States) around $270, depending on the retailer. 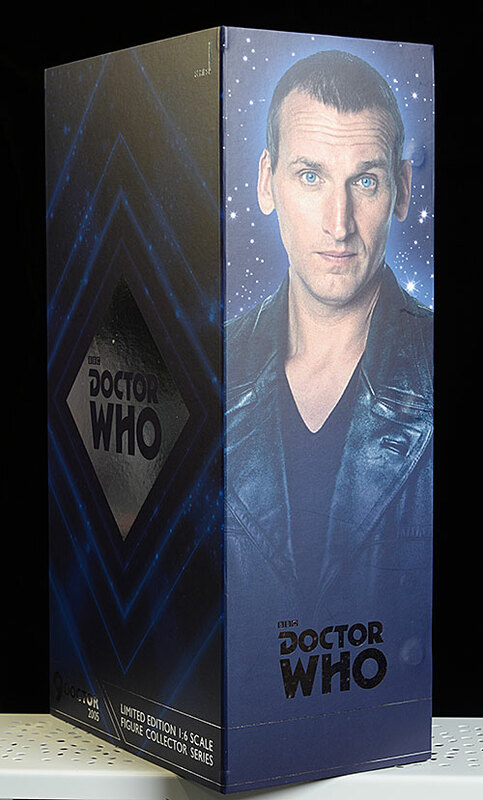 The boxes look great, with a shot of the actor on the exterior, along with the usual trippy Doctor Who designs. The outer cover is actually a three panel backdrop, printed on the inside. It's held in place over the window box with magnets, and once you pop it off, you can use it on your shelf as a basic diorama. Sadly, I forgot all about this when shooting the photos and didn't use it as my own backdrop, but it's a nice addition. The package is quite collector friendly as well, although you will have to remove some tape holding the smaller accessories in place in the plastic trays. Unlike most sixth scale figures, the Big Chief figures come with a small baseball card sized Certificate of Authenticity as well. As always, I'm grading this guy on three areas - realism, emotion, and accuracy. I used several stills to compare, including this one from straight on, this one from a slight angle, and this one with an angry look. The quality of Big Chief's sculpts has certainly improved, and I think even this figure has improved from prototype to final product. That's pretty rare, but they clearly listened to fans. The fine detail works to improve their realism. Skin texture looks great, and the tiny strands of hair create an appropriate hairline. The eyes are serious, and the wrinkles and bags look perfect. The life-like or emotive property of the expression is great as well. There's a tightness to the face, along with the perfect squint in the eye and ever so subtle smirk that gives him a life-like quality. Then there's accuracy, another area where I think they've really improved. 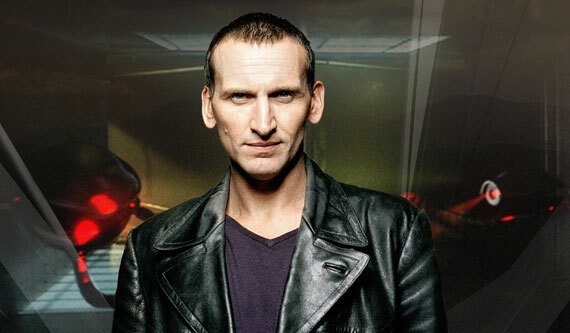 This isn't a caricature, but a very close match to Christopher Eccleston. The large ears look perfect, and the shape of the jaw and forehead are spot on. If I had one nit, it's with the nose - often an area of complaint - and they could have gone just a little further with the dip in the nostrils. Still, it's better than the usual generic Caucasian nose, and in hand looks very close. The one area that pulls this guy down is the smooth, basic neck on the standard body. Much like we've seen with companies like ThreeZero and Star Ace, the smooth neck becomes obvious against the finely textured face. The collar on the coat and shirt isn't high enough to hide it either, making it more of an issue this time around. Much like the sculpting, Big Chief's paint work is improving. 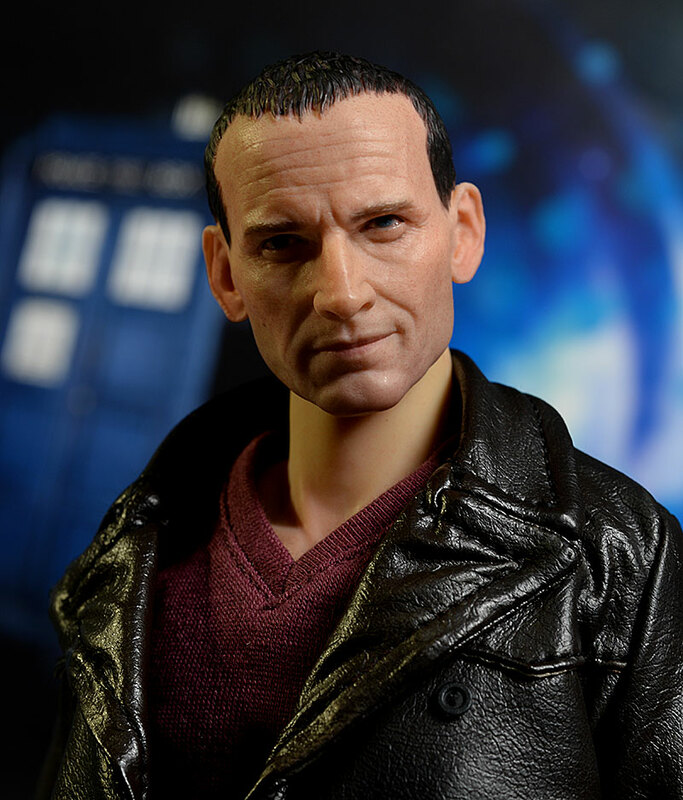 The subtle skin tone looks great, the hairline is fairly clean, and the eyes are sharp with almost no bleed. The lips are very realistic, and there's some nice shading around the jawline. But also similar to the sculpt, the unpainted neck is a distraction. It takes away a bit from the excellent work on the portrait, creating a juxtaposition between the two. The hands are quite plain as well, but it's less noticeable in person. The underlying base body is tight, with plenty of articulation and joints. Most are well designed, but the shoulders are really the standout. They are pretty much impossible to describe, but with multiple individual pieces interconnected to make each overall shoulder, the mobility is quite impressive. The lower body isn't as good, and the curved one piece boot sculpt doesn't do him any favors in standing in natural poses. The head also tends to ride up on the neck post, thanks to their very specific design. There is a rubber cylinder that covers the top ball joint, and the head slips down over this cylinder. That means it also slips up, particularly when the head is turned side to side, and it can give him a bit of a giraffe look, particularly with the coat removed. The hands swap of course, and there's extra wrist pegs just in case. I didn't have any issues though, and while they hands remain in place tightly, swapping them wasn't difficult. He comes with a ton of extras, all appropriate to the character of course. There are four sets of hands in total, designed to grip various accessories or work with specific poses. As I mentioned, they swap relatively easily, and while the sculpt and paint are pretty basic, they serve you well with different stances. 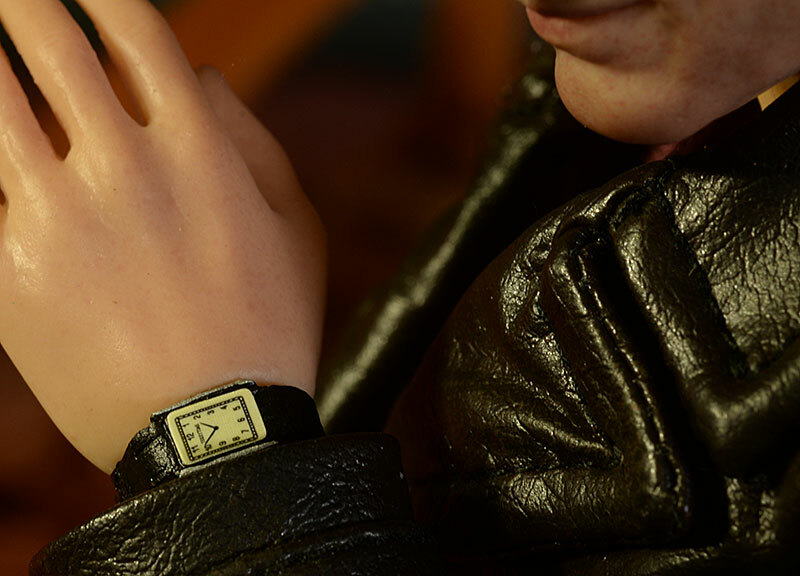 He has a watch, quite detailed, that he can wear, along with a metal chain to hold the key to the TARDIS. 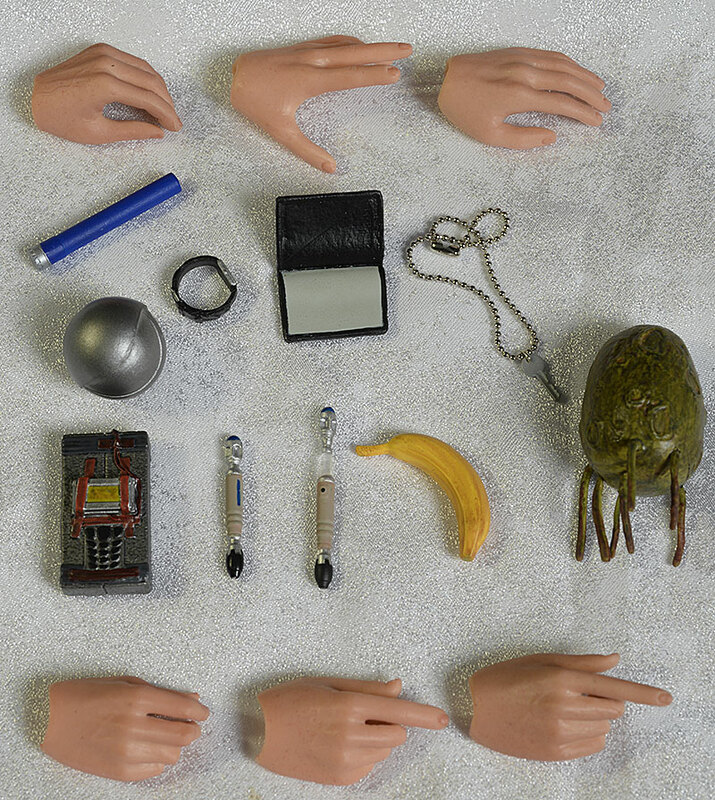 Other extras include the wallet with psychic paper (which we've seen before), the Robot Spider and a separate Robot Spider Orb, a banana, the tube-like Anti-plastic and the Anti-plastic bomb, and of course, the creepy Slitheen egg. 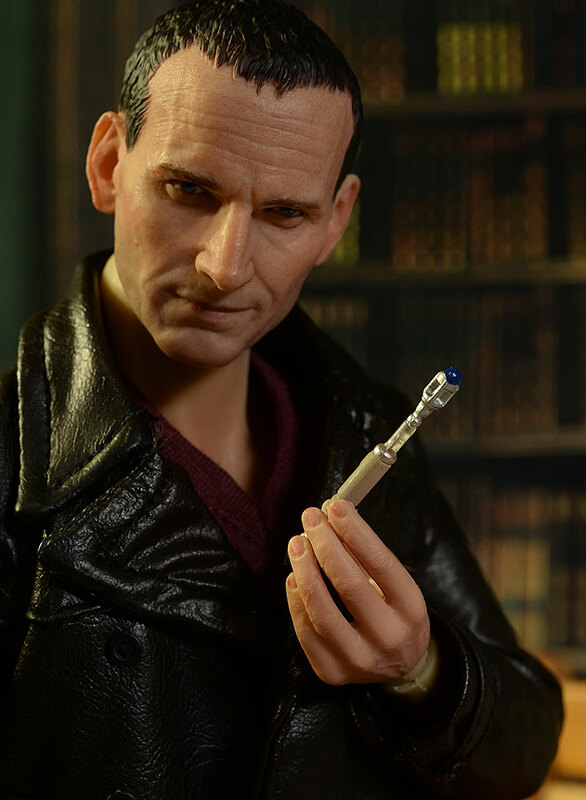 There's also an open and closed version of the Sonic Screwdriver, specific to this doctor. 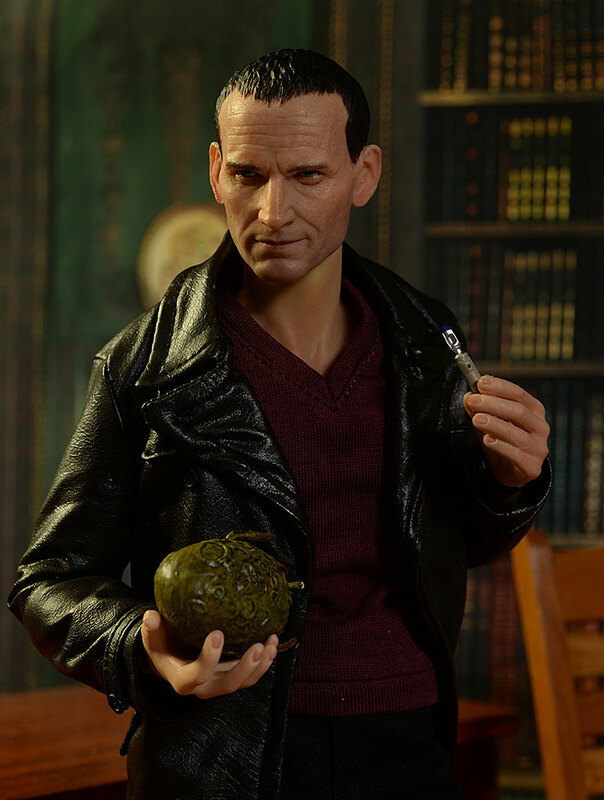 Scale seems a smidge small to me, but that's also an effect of the generally large hands on sixth scale figures. Earlier I mentioned that you can use the outer (very heavy cardboard) cover of the package as a display background. There's also a nifty display base, with the Gallifreyan symbol in the center of the mirrored base which lights up. Batteries are included. The outfit consists of the leather jacket, two shirts of different colors, the black pants, black tube socks, and the black boots. Overall, the material quality and construction is very good. The pants are properly tailored, and the boots look great. The curved sole is a bit of an issue for some stances, as they tend to push the figure backward toward the heels, but you can find ways to compensate. The long sleeve V neck shirts look good, although the green one has the seam in front, which looks a little odd. 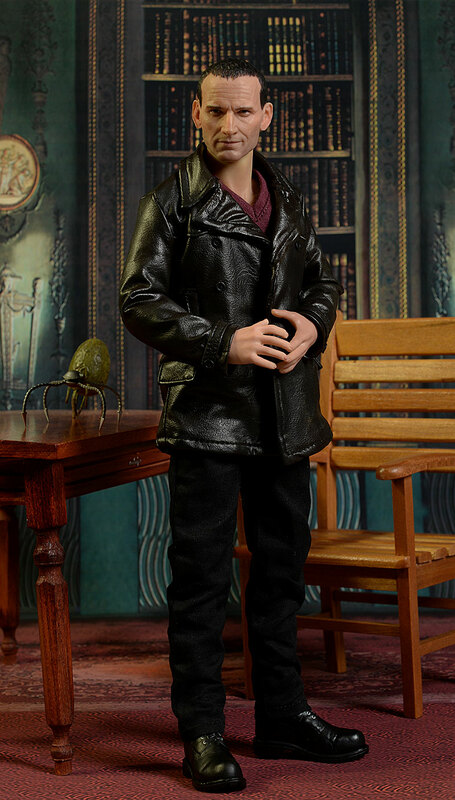 The leather jacket is well made, but the collar and lapels are a little out of scale. 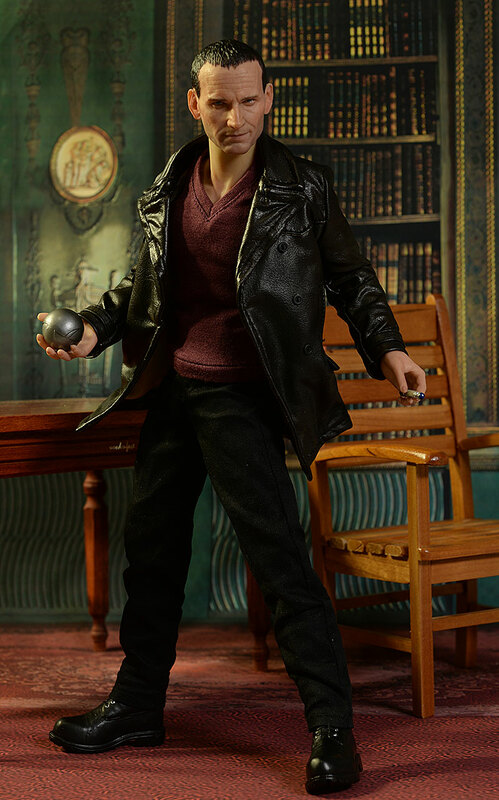 There's a wire running through the outer edge of the entire coat that allows for better posing, even in relaxed stances. The accessories allow for a ton of looks on the shelf, and the articulation is good enough to create some great poses. 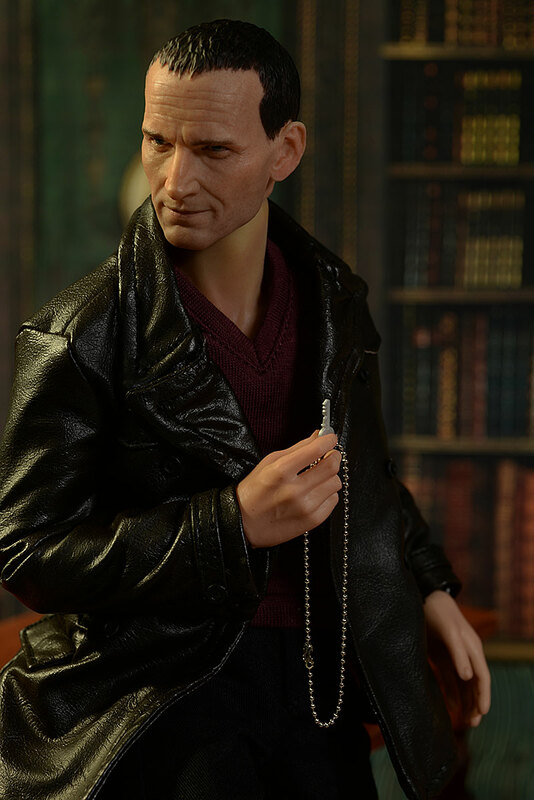 You should have a great time rearranging him regularly in the display, and getting the perfect look for the 9th Doctor. This is the one area where he takes a hit, but this may be a U.S. thing. 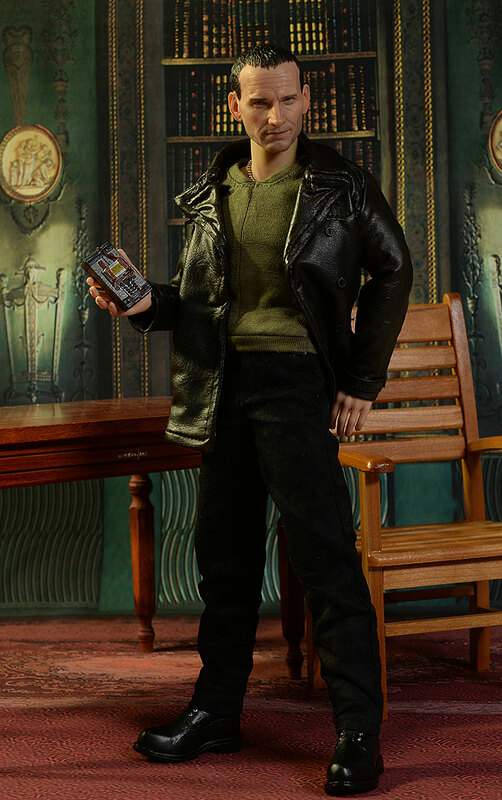 For us, picking him up is going to cost you around $270, high for even a Hot Toys figure. I'd put this guy around the Star Ace or Asmus level of quality, and those figures are running around $200, $220 with a good assortment of extras. The additional $50 is going to be tough for the casual Doctor Who fan, but the die hard will find it less of an issue. EDIT - if you order directly from Big Chief Studios, you can get it for around $190 US. That puts this guy in the average range where he belongs, and would up this score an additional star. Not much. The tiny legs on the egg and the robot could break if mishandled, but with normal precautions you should be fine. 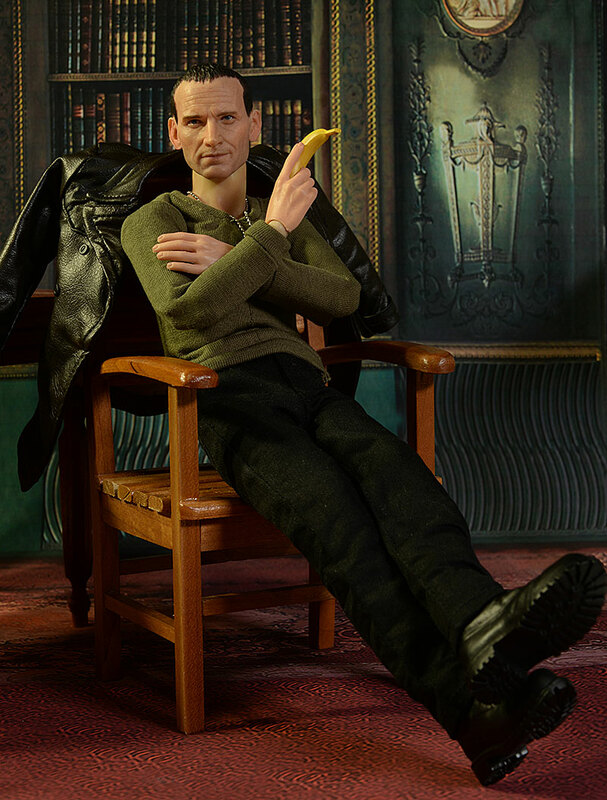 This is a solid step forward for the Doctor Who line and for Big Chief. They've improved the sculpting quite a bit, and the paint work is making strides as well. They have a way to go to reach the best in the market, but they are getting there, and with this release I'd say they are on par with companies like Star Ace, Asmus, and ThreeZero. The price is a killer, but these are advertised as a 'limited' edition, so I suspect the production numbers are pretty low. 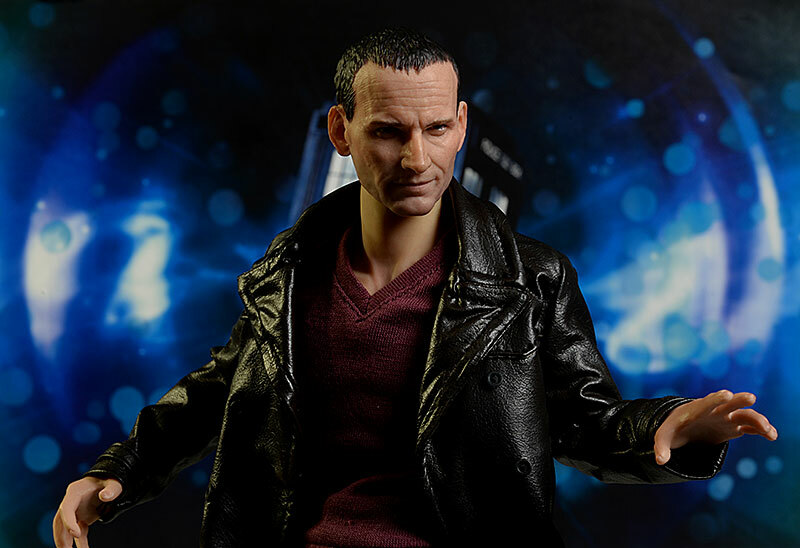 The next figure from Big Chief that I'll be checking out is Moriarty, and it will be interesting to see if the quality improvements are seen in the Sherlock license as well. And while I suspect the odds are very, very slim at this point, the quality of this release really makes me wish we'd see the Penny Dreadful figures that Big Chief teased make it to market. - has him for $275. - Entertainment Earth has him for $280. A few years ago I covered the BGS release of the 4th Doctor, Tom Baker. I have a guest review of Big Chief's Amy Pond and the Eleventh Doctor. as well as Weta's Dalek statue that would go great with this guy.